RIO DE JANEIRO — Michelle Carter loves to let the tension build. At the Olympics, she took it to extremes. 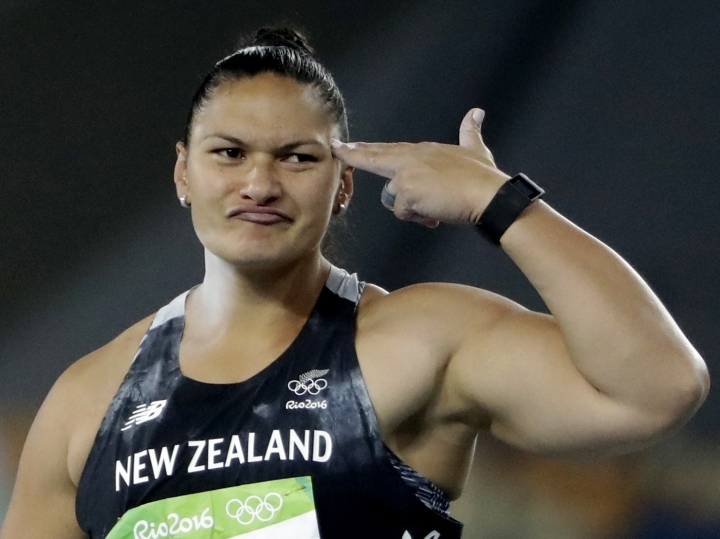 The American shot putter waited until her last throw Friday night to knock off arguably the best woman to ever compete in the event — two-time defending champion Valerie Adams of New Zealand. 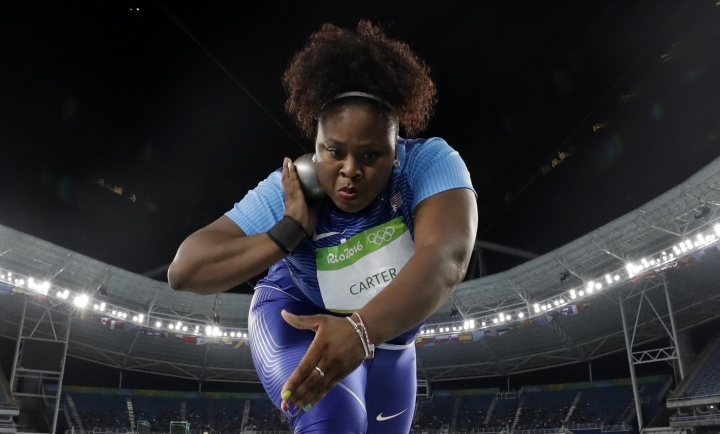 Now, Carter has a gold medal to go with the silver one her longtime NFL defensive lineman father, Michael Carter, captured in the shot put at the 1984 Los Angeles Games. It marks the first gold by an American woman in the event and just the second medal all-time. She joins an exclusive club that, until Friday, only included Earlene Brown, who won bronze at the 1960 Games. "It's not over 'til it's over," said Carter, who has a fashion line called Shot Diva. "I knew it was a good throw, but I didn't know how far it could be." Let the record show that the throw went 20.63 meters (67 feet 8 ¼ inches) to overtake Adams and break her own American record. Adams had the final attempt of the evening, but couldn't come close to equaling the mark. Anita Marton of Hungary was third. 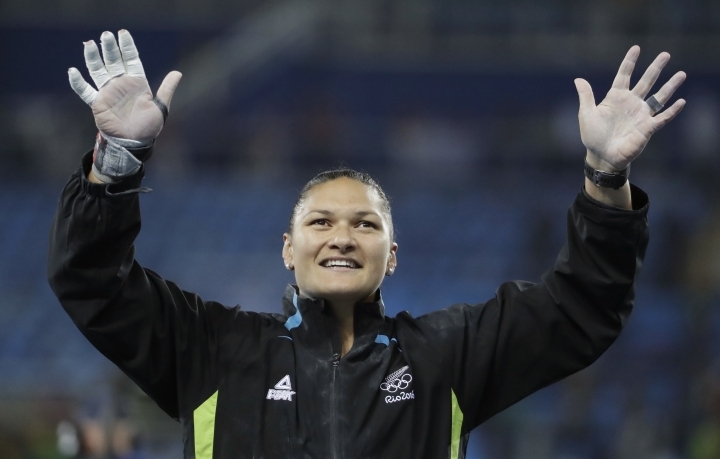 "That was a big throw," said Adams, who was going for an unprecedented third straight Olympic title in the event. "You can never underestimate anybody, especially Michelle. She's one of these people that can pop out anything, especially in the last round. "You have to expect the unexpected." This really shouldn't have been that unexpected. 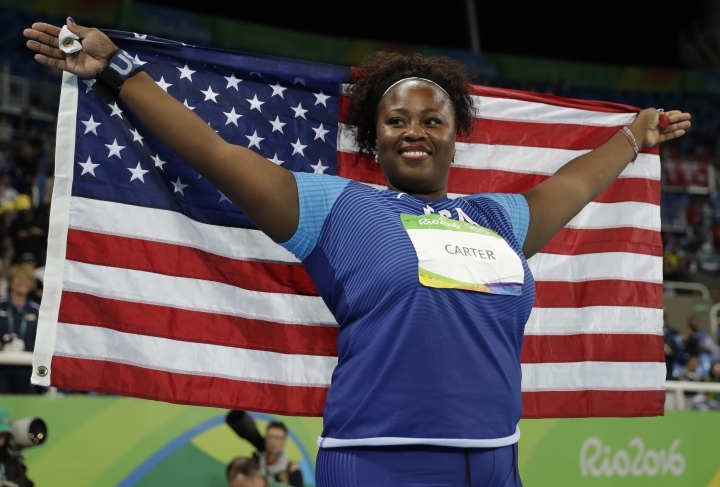 Carter won the title at world indoors in March on her last throw. 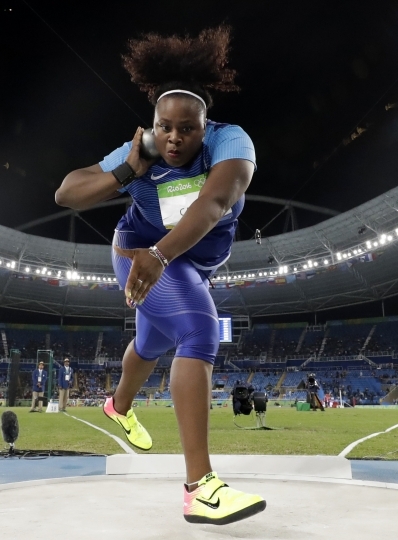 She also won at U.S. trials a month ago on her last throw. Just something they practice, her father said. Michael Carter was a defensive lineman for the San Francisco 49ers on three Super Bowl-winning teams. He said this doesn't compare with all those rings or even his own Olympic medal. It's way better. Growing up, Michelle Carter didn't know her dad threw the shot, only that he played football. 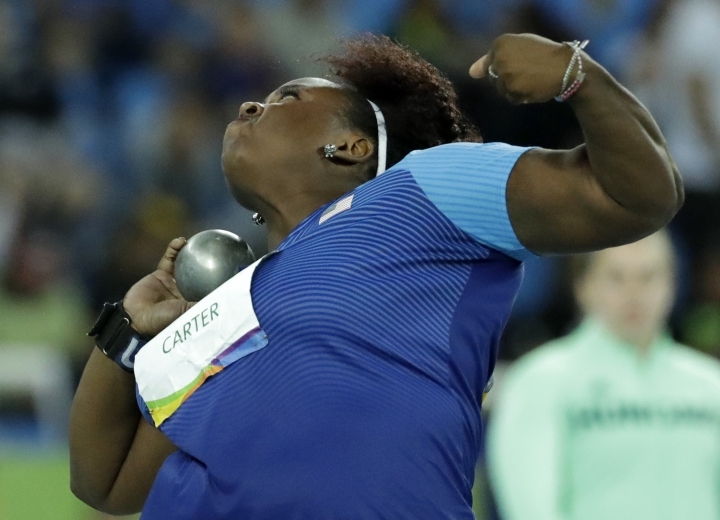 In seventh grade, Carter expressed a desire to try the shot put. At first, dad was a little hesitant, thinking she was only trying to follow in his footsteps. He worked with her through a record-breaking high school career, and thought his coaching days were done once she went to the University of Texas. But he was asked to help out, so he drove from Dallas to Austin — some 340 miles roundtrip — every two weeks to offer some guidance. 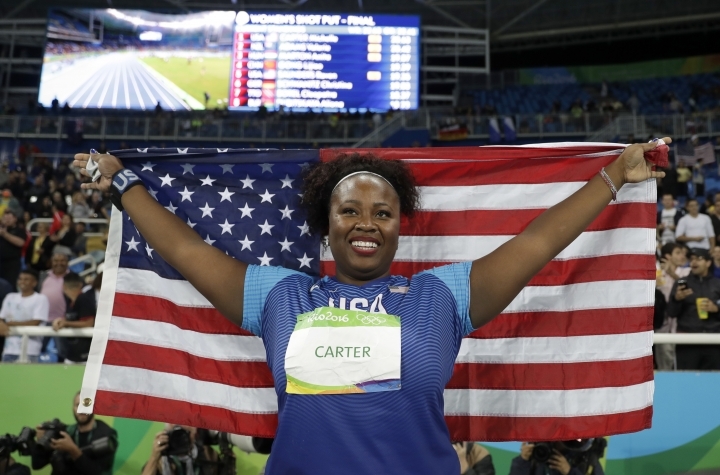 Carter has blossomed into one of the world's top throwers. 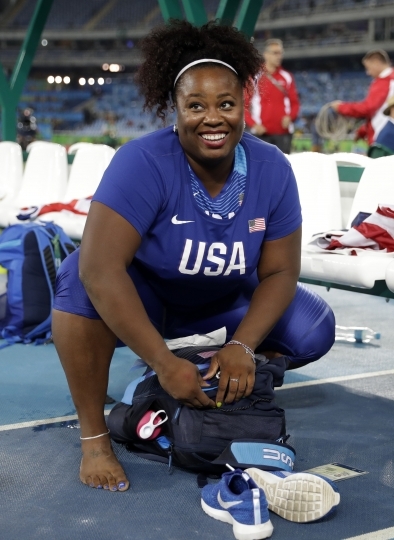 She set the American outdoor record of 20.24 meters (66 feet, 5 inches) in 2013 and broke the nation's indoor mark with a throw of 20.21 (66-3 ¾) to capture her world title in March. When healthy, Adams has been almost unbeatable in the event. She's a star in New Zealand, though she may only be the second-best known of her 17 brothers and sisters outside of her country. Her youngest brother, Steven, is a center for the Oklahoma City Thunder and famous for his distinctive mustache. It's been a tough road lately for Adams, who's had five surgeries over the last three seasons, including knee surgery this time a year ago that had her wondering whether she would be ready for the Olympics. She was, but couldn't bring home a third straight Olympic title. "It's a very hard thing to do and come away with," she said. "I want New Zealand to know I threw my heart out there. "I gave it my best shot. This is the best I came up with today. It's a little bit disappointing."